The first mention of the Winter Olympics was during parent – teacher interviews. I’d already become fast friends with the students, but this was the first time I had met any of their parents. I enjoyed the opportunity to tell them about the good work their children were doing in school. I have to admit I also enjoyed telling the parents about my adventures. One of the parents seemed especially interested to hear about all the places I had been, and in particular how much I enjoyed seeing unusual places. When we were finishing up, he paused for a moment and seemed to be considering something. 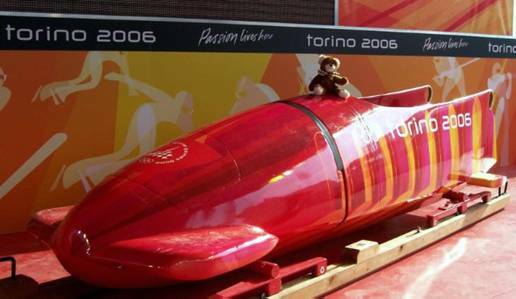 Suddenly he asked if I would like to come with him to the Winter Olympics in Torino. I laughed, and asked him if I looked like I was crazy? Of course I’d love to go with him to the Winter Olympics. He smiled, said it was a deal, and shook my paw as they were leaving. When I thought about it later, I realized he must have been playing a trick on me for talking so much about my adventures. It would be fantastic to go to the winter Olympics, but I knew it was impossible. I would never be able to do something that special. Or so I thought. In January I had an opportunity to return to Geneva and visit my family and friends. It was a wonderful trip, and on our flight back I was already looking forward to telling my grade 3 friends all about it. Imagine my surprise when the very next morning my traveling companion told me I wouldn’t be seeing my friends just yet, and that I should get busy packing my suitcase instead. 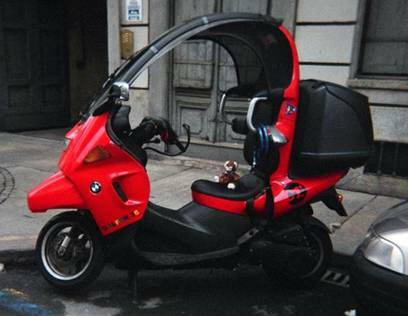 He said it was time to go on the trip we had talked about – the one with my special traveling companion. When I looked confused, he asked if I’d forgotten about the Winter Olympics. Actually I had forgotten. I had forgotten because I thought he was joking, not because I wasn’t interested. I was delighted to discover he was serious, and the very next day I was on an airplane heading for Torino. In a way, it was kind of amusing. I’d just spent two weeks in Geneva, and here I was, two days later, flying back over Geneva on my way to Italy. I made sure to wave to my friends as we flew overhead, though I don’t think they could see me. One of the first things we did after arriving in Torino, was to get our badges. 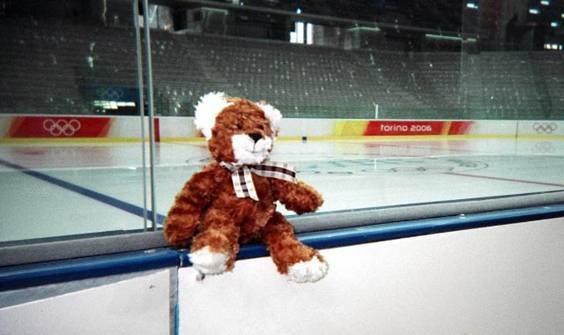 When my special traveling companion said I was going to the winter Olympics, I imagined being in the stands with thousands of enthusiastic fans. It was exciting to think about, because even if I wasn’t in the front row, I would still be there, in person. How could I possibly complain? Then I received my badge and looked at it. I was amazed. I asked if it was true, afraid that it might be another joke. He just smiled, and nodded. 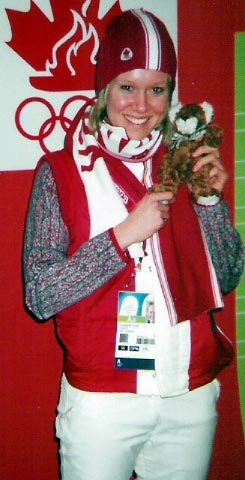 I was the only official mascot for the winter Olympics. 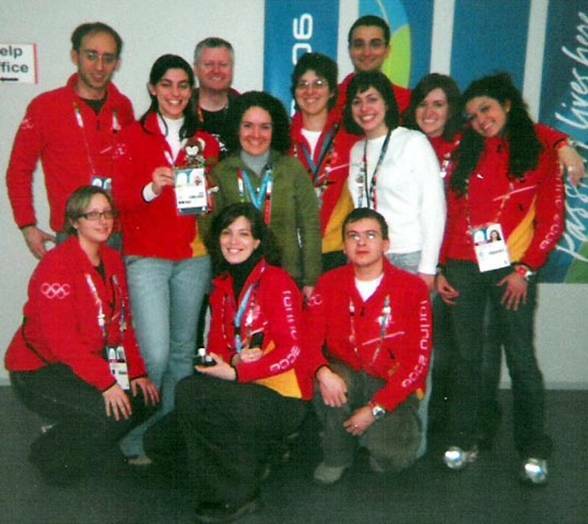 I had my own special security badge that allowed me to go anywhere I wanted to in the Olympic village. It was fantastic. My special badge meant that I wasn’t in the front row at the Olympic events. I was even closer than that - in front of the front row. It is amazing what you discover when you can wander anywhere in the Olympic village. Fascinating things happen all the time, not just during competition. I liked watching the athletes practice before events. It is exciting to watch a race, with all the fans cheering insanely, but during practice you see a completely different side of things. You see the hard work, the challenges the raw talent, and the drive to win. You can watch all that as if it were your own private show. Of course you have to be very quiet so you don’t ruin their concentration, but I am very good at that. I have a perfect image of it all in my memory. It made me feel very lucky. 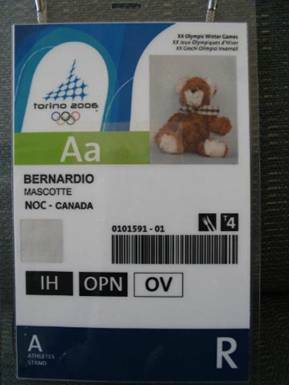 With my special pass I was able to do many things that most people at the Olympics never dream of doing. 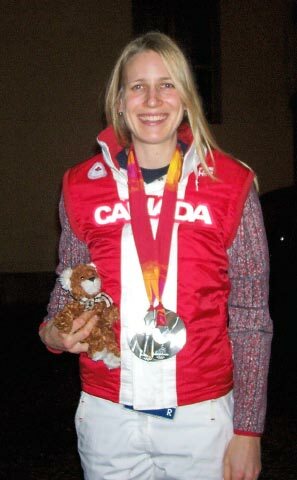 I marched with the Canadian team in the opening and closing ceremonies. I can still feel the excitement in the air as we came into the stadium with tens of thousands of people cheering for us. You probably didn’t see me if you watched it on television, because I am rather shorter than most of the athletes. Actually, I’m shorter than all of the athletes, but I was there, I can assure you of that. I watched every event I wanted to, from the perfect spot. I watched the hockey games from right behind the player’s bench, cheering them on whenever they scored. I even tried some of the events, or at least almost tried them. I went skiing for a day, which was great fun. I sat in one of the racing sleds imagining what it would be like to be screaming down the mountain at 100 miles per hour. My special traveling companion asked if I wanted to give it a go. It was awfully tempting, but in the end I decided that ”screaming” down the mountain was exactly what I would probably end up doing. I know saying no was the right decision, but I still sometimes wonder what it would have been like. When I say I was allowed to go anywhere, I really do mean anywhere. I ate in the cafeteria with the athletes. I relaxed in the athletes lounge and slept in the same dormitory. I even rode on the busses with them. Before you say anything, I know what you are thinking. I don’t have my seat belt on in this picture. That is because the bus isn’t moving. You know that I had it done up when we were driving, don’t you? I got to know the athletes quite well, and they would wave and say hi whenever they saw me. I was cheering for all our athletes, but I was especially excited about the Canadian women’s speed skating team, and went to watch all their events. I like to think that my cheering was one of the reasons they won so many medals. Cindy Klassen and Kristina Groves were both kind enough to show me their medals. It was fantastic. Wherever I travel I always find special animals that can sit so still that most people don’t ever realize they are alive. I always try to stop and say hi. They often have great stories of their own, and I always enjoy telling them about my adventures. I have to be careful not to move when anyone is looking, but I don’t find that difficult. In Torino I found a raven who took me flying when no one was looking. The view of the Olympic village from the air was spectacular. The trickiest part was finding a quiet place to land. We had a few close calls, but we finally managed it. We both agreed it was well worth the effort. It isn’t unusual to find animals who sit very still, but I have never before met a human who did that. I guess there is a first time for everything, because I met someone like that in Torino. He told me his name was Ronald. I met him outside a little restaurant that seemed to be very popular with the people there. He assured me that my grade 3 friends would almost certainly be very familiar with it. I was surprised, because to be honest, I’d never heard of it. I checked later with some of my bear friends, and none of them had heard of it either. This confused me a bit until I went in and looked at the menu. Suddenly it was obvious. There was no raw fish on the menu at all. Not even a single appetizer. 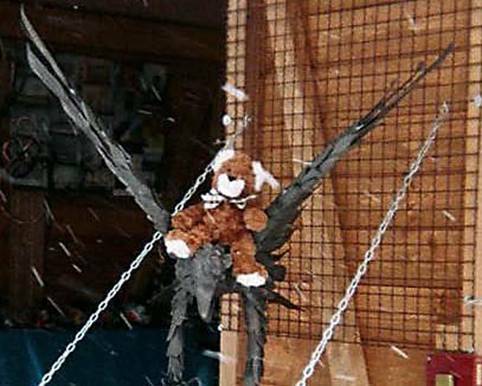 It was clear they were not trying to get bears for customers. 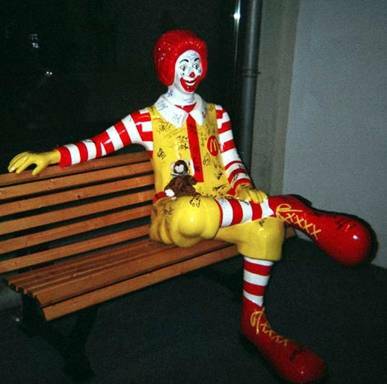 Still Ronald and I had a wonderful talk, even though he insisted on sitting very still every time someone walked by. It was strange to meet a human who did that, but in a way it made me like him all the more. 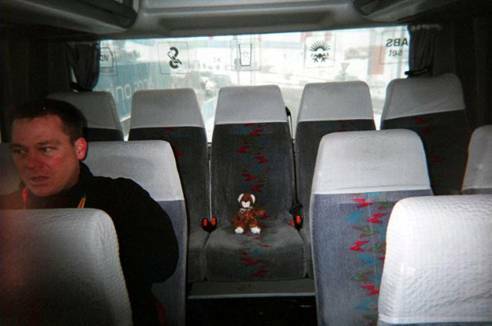 My special traveling companion was a member of the security team for the Olympics. I know all about the security business because my dad works in security in Geneva, for the Aboriginal Bear Committee. I’ve even had one or two security assignments myself during my travels. Some of the equipment was new to me, but I’m a quick learner, and before long I was familiar with most of it. 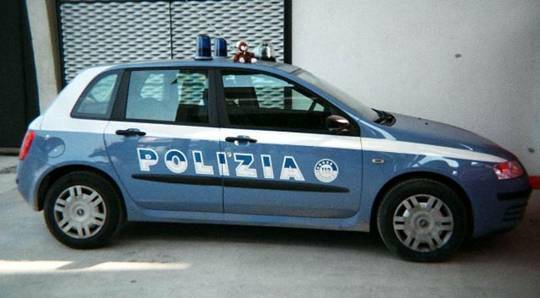 I had great fun riding around Torino on the “Polizia” cars, and testing out the small motorcycles. 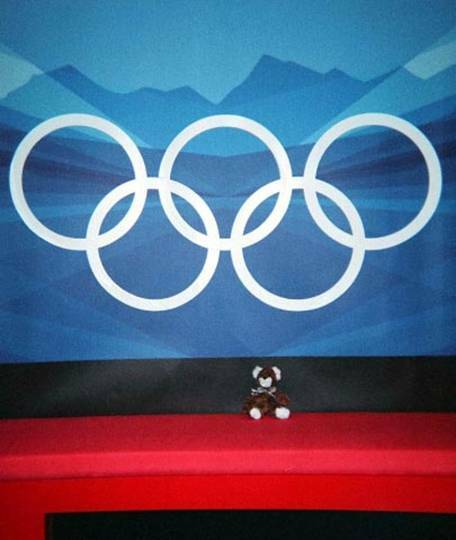 There was one thing about going to the Olympics that worried me from the very beginning. Who I was going to cheer for? I live in Canada now, but I’m from Switzerland. All my grade 3 friends live in Canada, but my friends from Bear School, and my family, all live in Switzerland. It was bothering me so much that I was beginning to lay awake at night worrying about it. Someone suggested that I shouldn’t go to any events with either Canada or Switzerland, but that just seemed silly. I never seriously considered it. But I still had a problem, and I couldn’t see any easy way to pick who to cheer for. Suddenly, in a flash of inspiration, I had the answer. Sometimes there are two athletes from the same country in the same event. When that happens, most people from that country just cheer for both at the same time. I decided that I would sort of do the same thing. I would cheer for Canada and Switzerland. That is exactly what I did, at least most of the time. 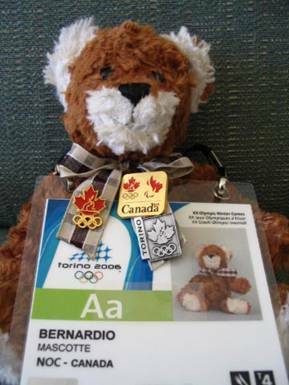 Of course, my badge said that I was the official Team Canada mascot (or as they say in Italian, mascotte). My room was with Team Canada, and of course there were also the posters. My grade 3 friends from Stittsville all drew posters to cheer on Team Canada, and sent them to Torino. The posters were on the walls all around Team Canada’s building, and they all had my picture on them. That was one of the reasons all the athletes got to know me so well. 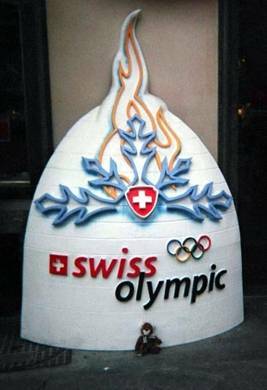 I did try to cheer for Canada and Switzerland equally, but I suppose if I’m being completely honest, I have to admit that most of the time I was thinking of my new grade 3 friends from ALC in Stittsville, and I was cheering just a tiny bit more for Canada. 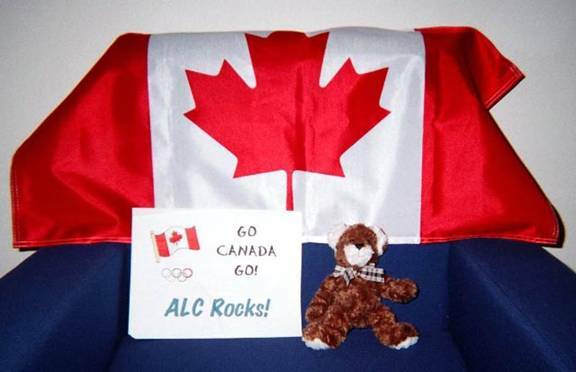 Besides, how could I possibly ignore the fact that ALC Rocks! 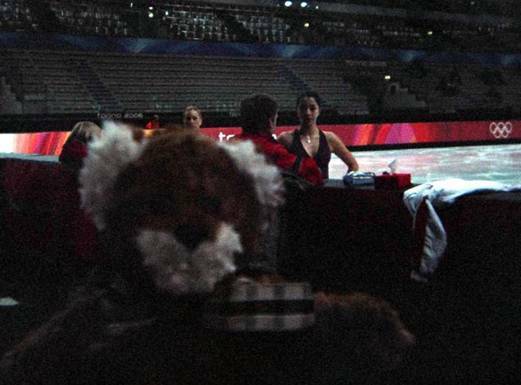 Of course I made many new friends in Torino too. I’ve already mentioned the athletes, the Raven, and Ronald, but I met so many others as well. Right from the first day I found that everyone was very friendly. 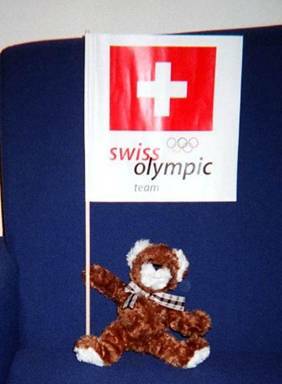 The volunteers who were making the athletes badges were surprised to see a traveling bear but once we began talking about my adventures they wanted to hear all about them. We had a wonderful talk, and when my badge was ready they all insisted that I have my picture taken with them. I was more than happy to oblige. I’ve come to realize that growing up in Geneva I never really gave much thought to old buildings and ruins. We had them all over the place, so they never really seemed to be anything special. However, my usual traveling companion is mad about them. Whenever he sees ruins, he makes me go over with him and have a look at them. Usually they just look like broken buildings to me, but he seems to be fascinated with them, and can wander through them for hours. The ones that interest him the most are ancient Roman ruins. You can probably see where this is going, can’t you? The Olympics were in Italy. What better place to see Roman ruins than Italy? 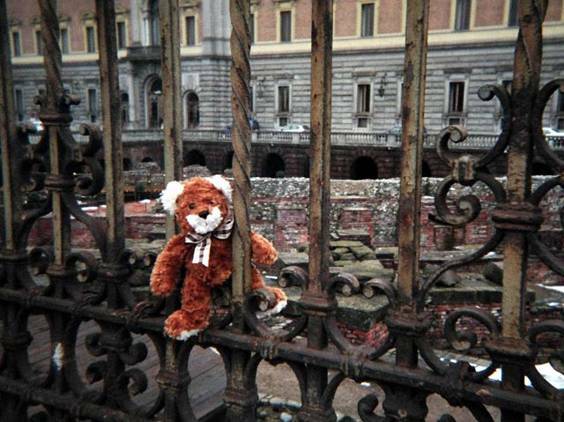 My traveling companion couldn’t be in Torino, but when I saw some Roman ruins I immediately thought of him, and found myself strangely interested in taking a closer look. I’m not sure I completely understand what he sees in them, but I’m finding they are beginning to grow on me. I was pleased that I was small enough to slip between the bars in the fence and go in to have a closer look. Perhaps I’ve been hanging around with him too long, or maybe I’m just learning to see things in a new way. We shall have to see. It was a wonderful, exciting two weeks at the Winter Olympics. I met some amazing athletes, and made many new friends. I watched the Olympic events from the best seats in the house. I marched in the opening and closing ceremonies. All of that was wonderful, but on the last day I took the opportunity to just sit under the Olympic rings, watching, listening, smelling, feeling, and taking everything in. I loved the feeling that I was a part of it all – a small piece of history in the making. I think that many years from now, when I look back on my time in Torino, that image will still be my most intense memory. As I write this I can feel the joy of just sitting on that bench, under the Olympic rings, experiencing the moment.